Good afternoon, ladies and gentlemen. It's a great pleasure to be here to speak at a very interesting forum. When Paul (Chief Executive of Reed MIDEM, Mr Paul Zilk) first mentioned this Proptech, I thought it's "pro tech", so of course I have to come because I have now a policy agenda to push Hong Kong's innovation and technology development. But having clarified that this is Proptech, that is technology and property, I am equally happy to come because Hong Kong is very famous for her real estate with very expensive property prices. So maybe with the application of technology you can help the Chief Executive to dampen a little bit the very high property prices. Seriously, I'm on a first visit to France in my capacity as the Chief Executive of the Hong Kong Special Administrative Region, and this visit to France is coming to an end. I've been here for six days already and I am leaving tomorrow. As one of the final highlights, to be able to speak to an audience interested in technology and property is very much to be welcomed. Because this is an occasion that I actually don't know who are the people that I'm speaking to, how familiar you are with Hong Kong, so I have decided to give you an overall view on the Hong Kong advantage in developing innovation and technology, and hope that it will interest some of you, including start-ups, to consider using Hong Kong as your next destination for innovation and technology. Just some basic information about Hong Kong when I said Hong Kong does have this advantage for innovation and technology. One is we are a very free and competitive economy. In fact, we are the world's freest economy, as ranked by the US-based Heritage Foundation for 24 years in a row. We're also amongst the world's most competitive economies. In the recent report published by the Swiss-based Institute for Management Development, we came second after the United States of America. And all the freedoms and rights of the Hong Kong people, as well as expatriates working in Hong Kong, are enshrined in the Basic Law, which is a constitutional document governing Hong Kong, because after 1997 Hong Kong is governed under "One Country, Two Systems". To do innovation and technology, or to do business in general, you need to have a very stable environment where there is certainty. Hong Kong prides herself on the rule of law. We have a very robust IP protection regime. We are business-friendly. We practise a very simple tax system and very low taxes. For profits tax, the flat rate is 16.5 per cent, and recently my Government has introduced a tax concession to halve the 16.5 per cent to 8.25 per cent for the first HK$2 million profits for every company - $2 million will be roughly 225,000 Euros. This should be very attractive for small and medium enterprises including start-ups. And we run a very efficient and clean government. We have the people that are needed to develop innovation and technology because four of our universities are amongst the world's 100. So in terms of city, we are perhaps the city with the most intensive concentration of distinguished universities, and they are very good at research as well. At the same time, we have very professional and competent professional services in legal, finance, corporate, accounting, and engineering. For those of you who have visited Hong Kong, you will feel very at home, because we are a very international, cosmopolitan society. English is widely spoken in Hong Kong - it's one of the two official languages. People also speak Mandarin, in addition to Cantonese, which is the local dialect. And we are one of the safest cities in the world. In fact, the total crime rate per 100,000 population now in Hong Kong, which only stands at 758, is the lowest since 1971, so this is a city you will feel very safe in. Even if you are walking at night by yourself or even if you are a lady, you should feel very safe. We are a liveable city, very walkable. You don't even need to drive in the city of Hong Kong. Over 90 per cent of the daily passenger trips are looked after by public transport - about half by the MTR Corporation. And we are a very green city, only 24 per cent of the land has been developed and 40 per cent has been preserved for the people and tourists to enjoy, it's what we call country parks. France is very good with F&B. We are also very good with cuisine, in fact we have over 11,000 licensed restaurants in Hong Kong. I think many of them are offering very good French cuisine, but of course when it comes to wine we have to import from Bordeaux, and maybe Burgundy. Hong Kong is very convenient. Our international airport is the world's number 1 in terms of cargo and number 3 in terms of passengers, receiving over 17 million passengers every year. You can fly from our international airport to 220 destinations all over the world, and in fact half the population could be reached within a flight of about five hours. As I just mentioned, constitutionally we are "One Country, Two Systems". We are part of this growing nation, the world's second largest economy – the People's Republic of China – but after 1997, when we had been reunited with the Mainland of China, we maintained our own system, that's where the "Two Systems" come in. We have our own legal system which is premised on the common law jurisdiction, we have our own currency, which is the Hong Kong dollar, we have our own monetary system, financial system and so on. But, as China is growing in terms of economic importance, President Xi Jinping, said in his recent National Congress Report that the Central Government would support Hong Kong to integrate more fully into the Mainland's development. Paul has mentioned about the Belt and Road and about the Bay Area, which I hope to cover in a moment. Hong Kong's advantage also lies in being the gateway to China. In other words, people and businesses that want to do business and invest in China, the best place to start is Hong Kong. On the one hand, we are very close to China's big market of 1.3 billion population, and we have four decades of experience working with Mainland China, because this year, 2018, is the 40th anniversary of the opening up of China's economy in 1978, and since then Hong Kong businesses and professional service providers have been going into the Mainland market to provide services to invest, to open factories and so on. So, we are an expert in accessing the Chinese market. And it is to be borne in mind that while China is still categorised as a developing country, the middle class is growing. When the middle class is growing, the demands for quality goods and services will rise, including a lot of affluent goods and wine from France, and also high quality services including medical services and engineering services that this country has to offer, particularly in the area of the AI industry, because part of my trip coming over here is to learn more about the French technology, artificial intelligence and health technology. We are forecasting that this domestic artificial intelligence industry will grow significantly in the coming years. To become the gateway to China, we also need very strong national support. I'm pleased to say in my capacity as the Chief Executive now, who has direct access to the leaders, including President Xi himself, it is very obvious to me that the Central People's Government wants to support Hong Kong, wants Hong Kong to succeed under "One Country, Two Systems", and maintain her own way of doing business, of living and so on, particularly in two major initiatives of the nation. One is the Belt and Road Initiative. The Central Government will support us to play an active part in the country's Belt and Road Initiative, which actually reaches three continents, and I'll show you a map later on. The other initiative is closer at home, it's the Guangdong-Hong Kong-Macao Bay Area, which again I'll show you a map so that you have some feel. The Belt and Road Initiative was announced by President Xi Jinping about five years ago. It is an initiative trying to connect with many countries and economies along two passageways. One is the Maritime Silk Road, one is the land-based economic silk belt. These two routes cover over 60 countries in three continents of Asia, Africa and Europe. There will be a lot of demand for infrastructure, financial services, and professional services arising from the Belt and Road region, with projects either financed by China or by other enterprises, and that's why it will bring a lot of opportunities to economies which are very good at providing some of this services support. This Belt and Road covers 62 per cent of the world's population. At the moment it's about only 31 per cent of the global GDP but it is destined to grow. I am sure you have heard about the growth of India, the rising importance of the ASEAN region, the Southeast Asian nations of Thailand, Vietnam and so on. The other initiative is in the southern part of China. There is a big province called the Guangdong Province, which is next door to Hong Kong, and the national strategy is to develop this area, the nine affluent cities in Guangdong plus Hong Kong and Macao, two Special Administrative Regions, into a Bay Area type of economy. You can describe it as a city cluster, but we tend to prefer calling it a Bay Area economy as per the San Francisco Bay Area, the Tokyo Bay Area and the New York Metropolitan Area. And this Bay Area has a population of 68 million people, a GDP of US$1.5 trillion, which is about the size of Australia, and it is still growing, as I mentioned about the middle-class growth in the Mainland of China. Together we want to have a free flow of people, goods, services, finance and capital within the Bay Area. So hopefully through some supportive policy measures, there will be very little barriers in accessing this particular part of the Mainland of China in terms of goods and services. And particularly relevant to this afternoon's topic is technology. One of the highlights in the Bay Area is to develop a world-class, global innovation and technology hub very much like the Silicon Valley in San Francisco Bay Area, because we are seeing a lot of potential for going into this area. Why do I feel that we have that potential for contributing to a world-class innovation and technology hub in the Bay Area? One is Hong Kong has world-class information infrastructure. At the moment we already have 11 submarine cable systems in Hong Kong. We have very strong data centre clusters, still building these high-tier data centres in an industrial area called Tseung Kwan O, and Google has just recently opened a Google Cloud platform in Hong Kong. Second is we have a thriving technology ecosystem and this ecosystem grows very rapidly once it has found its niche. Amongst the world's start-up ecosystems, Hong Kong is one of the fastest. I'm sure France is the other. I went to see Station F, this year with 3 000 people working in start-ups in this project. And over the last three years, we really have seen the number of start-ups booming and growing in Hong Kong, that now we have over 2200 start-ups. Some are staying in the facilities that the Government is providing. Start-ups will need venture capital. The provision of venture capital by the private sector has been growing and the Government is also chipping in the government money to provide venture capital. We are very pleased to see that in our own I&T nurturing, we have already grown three unicorns in artificial intelligence, in courier services and so on. And this very famous drone is also conceived by researchers in Hong Kong but then produced in Shenzhen called DJI. It is now becoming a very valuable asset. The third factor is we have the infrastructure, because start-ups need a place to work and researchers also need their facilities. At the moment, we have two flagship facilities in innovation and technology, one is the Science Park under the Science and Technology Parks Corporation, the other is the Cyberport. There's a little bit of division of labour between the two. Cyberport is more focused on Fintech whereas Science Park provides space for a lot of technology areas. And we are not stopping at this stage. Right now we are still expanding the Science Park and amongst the expansion is a building which is called InnoCell, because I appreciate, I just said at the beginning, property prices are very high in Hong Kong, both for researchers and scientists to come to Hong Kong to work with us. Finding a place to stay is a major problem. So, with this InnoCell on-site we'll be providing 500 units for researchers so they can live and work in the Science Park. And looking ahead, we already have plans to develop an 87-hectare second science park in Hong Kong in an area which is very close to Shenzhen called the Lok Ma Chau Loop - 87 hectares, able to build about 1.2 million square metres of GFA, which is about four times bigger than the first Science Park that I have just shown you. This will provide more space and land for technology companies to work from. We are starting to do construction work on this second Science Park. And by the way, it is branded as a Hong Kong-Shenzhen park because we will work very closely with the city of Shenzhen, which I'm sure you know now accommodates a large number of tech companies like Tencent, Huawei and so on. We expect to deliver the first plot of land in 2021 for these technology centres and laboratories to be built on it. Since I took office on the 1st of July last year, in a few months' time I and my team, including Nicholas Yang, have met with a lot of tech people, whether it is Jack Ma of Alibaba, Pony Ma of Tencent and all these venture capital companies. And as a result of those interactions, I've come up with an eight-pronged strategy to grow Hong Kong's innovation and technology. I will just briefly take you through these eight areas. One is talent. And I'm sure we have talents in the audience. We need more talents, local talents and overseas talents, to join us in this very ambitious policy drive. We have a Technology Talent Scheme that provides funding for postdoctoral positions. Some of these are actually in enterprises. So when enterprises take on a postdoctoral candidate, we actually pay for that postdoctoral position. That will make it easier for the private enterprises, especially the smaller enterprises, to be able to nurture and retain these talents. And we have a Postgraduate Research Studentship Programme of $3 billion that we will pay for postgraduate students doing research in our local universities. There's also a Technology Internship Programme arranged by Science Park and Cyberport. And very recently, we've introduced a Technology Talent Admission Scheme, that is an immigration scheme that will give easier access and much faster processing time for tech talents. So tech companies will apply and be given a quota, and with that quota, they can recruit worldwide and once they recruit and use their quota then our immigration authority will issue the work visa for these tech talents, so it's a very fast-tracked arrangement. I just mentioned we also put in our own money to invest in promising start-ups, so we have a $2 billion Venture Fund for that purpose and we are working with private sector venture capital on a matching basis. On infrastructure, I've already mentioned about the second Science Park we are building. The third strategy is to open up government data so that researchers have easier direct access to the huge amount of data that the Government is keeping, whether it's on education, on medical, on transport, so that it will provide the energy and the necessary input for research to be undertaken by research companies and start-ups. Popular science education is very important for any place that aspires to become a technology hub. So apart from supporting our universities to do more R&D to have more international collaboration - just like this morning, I witnessed the signing of an MOU between Hong Kong University medical school and Institut Pasteur here on biomedical technology and research co-operation - we have also to do more on popular science so that young kids will start to pick up greater interest in STEM – science, technology, mathematics and engineering. Upgrading the Science Museum, making it more interesting for kids to visit, is also one of the initiatives that we have announced. I know that as we move on to the innovation and technology field, some of the legal provisions that are in place may not be able to catch up with this new requirement, so I have an exercise to review the legislation and regulations in Hong Kong to see whether certain provisions are outdated and others are obstructing the development of technology and need to be revisited. Government is a major procurer of goods and services. For example, the Government budget accounts for 21 per cent of the GDP. So we can lead by example by injecting more innovation and technology into the way we buy things or we buy services. Another review is going on to change the government procurement rules to give more, I wouldn't say favouritism, but to give a bit more weighting to innovation and technology in getting the government tenders to provide goods and services. Research funding is very important and they tend to be rather expensive because to have successful R&D takes time and they have to be on a sustainable basis. So we already have an ITF, Innovation and Technology Fund, that provides the long-term funding to some research projects. Lately we gave this fund another HK$10 billion so that it will have more than enough for the time being to fund these R&D propositions. 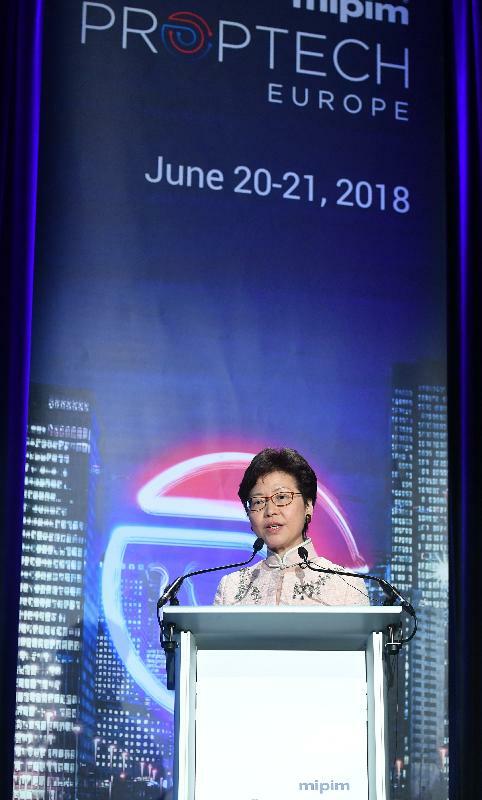 I have set for my Government a very ambitious target - that is within my term, up to 2022, we want to double the R&D expenditure in Hong Kong, both public and private sectors taken together, from the current 0.7 per cent of GDP to 1.5 per cent. That is equivalent to about HK$45 billion every year on R&D spending. This is actually not bad although people will compare us to places like South Korea, which is 4 per cent, or Singapore, which is 2 to 3 per cent. But you have to appreciate that in Hong Kong, we don't have any defence R&D because foreign diplomacy and security defence are matters for the Central Government, so we don't really need to go into that area of defence research. Secondly, we will incentivise the private corporations to spend more on R&D, and the best way to incentivise corporations is through tax relief measures. How do we do it? We are providing for the first time in Hong Kong's very simple tax regime something called super tax deduction. For simple illustration, a company that spends $100 million on qualified research areas in terms of assessing profits tax liability, we will give them two times or three times relief. The current two-tier system is that the first $2 million R&D will attract a 300 per cent tax deduction. Anything above $2 million will attract 200 per cent tax deduction. And the beauty of our tax concession is we do not impose any limit. You can spend as much as you like and still enjoy this major tax deduction. The third way to increase R&D expenditure in Hong Kong is of course to attract companies and laboratories to Hong Kong, and their R&D expenditure will become Hong Kong's R&D expenditure. So we have a plan to create R&D clusters in two particular areas – one is health technology, the other is artificial intelligence and robotics. Apart from these two areas which we will build a cluster, we are already quite strong in Fintech because Hong Kong is a financial services centre and we already have the Cyberport providing the necessary support and incubation for Fintech. And I know Proptech is actually a sub-sector of Fintech so we welcome any Proptech start-ups to consider working with us at the Cyberport. The fourth area is smart city. Many of the cities aspire to become smart cities. This is not an easy target, but I would say that we are working through a blueprint in smart city. The reason why we chose AI and health is because we feel that we are strong in those areas with our research capability, and by inviting overseas institutions to come to us, we will be able to kick-start this area much faster. And that's why in this trip to France I went to visit the École Polytechnique and the Sorbonne University to explore opportunities for them to consider working with our universities in this particular cluster of bio-health technology as well as AI and robotics. We are putting in another $10 billion to support these two clusters in Hong Kong. The Smart City Blueprint in Hong Kong was announced last December. It involves a lot of things - it will take me another half an hour to present to you Hong Kong's Smart City Blueprint. So, hopefully, let's leave it to another occasion if Paul Zilk is going to bring Proptech to Hong Kong in the near future in the same way that MIPIM brought a property exhibition, MIPIM Asia, to Hong Kong for the last 10 years. And I truly believe that in our Smart City Blueprint there should be plenty of opportunities for application of technology in property and real estate management. So thank you very much for giving me this opportunity to share with you the exciting developments, and I look to working with some of you in our future endeavours.